Weber State University (pronounced /ˈwiːbər/ WEE-bər) is a public university in the western United States, located in Ogden, Utah, north of Salt Lake City. It is a coeducational, publicly supported university offering professional, liberal arts and technical certificates, as well as associate's, bachelor's, and master's degrees. Weber State University is accredited by the Northwest Commission on Colleges and Universities. Programs throughout the university are accredited as well. The city of Ogden is the seat of Weber County. The school was founded in 1889 as Weber Stake Academy, later changing names to Weber Academy, Weber Normal College, and Weber College. Weber College became a junior college in 1933, and in 1962 became Weber State College. It gained university status 28 years ago in 1991, when it was renamed to its current name of Weber State University. View of Weber State University campus from Ogden's east bench. The Stewart Bell Tower is the most identifiable landmark of the Weber State campus and was built in 1972. Weber State University was founded by The Church of Jesus Christ of Latter-day Saints as the Weber Stake Academy in 1889. "Weber" comes from the name of the county where the university is located. Weber County was named after John Henry Weber, an early fur trader. The university opened for students in 1889 with 98 students enrolled for classes on January 7. The first principal of Weber Stake Academy was Louis F. Moench; he served from 1889 to 1892 and again from 1894 to 1902. In the latter year, Moench was succeeded as principal by David O. McKay, who served in that position until 1908. From 1914 to 1917, James L. Barker was the principal of the Weber Stake Academy. In the early 20th century, the school underwent multiple name changes: Weber Stake Academy from its founding in 1889 to 1897, Weber Academy in 1902, Weber Normal College in 1918, and Weber College in 1922. By the late 1920s, however, the college was in financial difficulty, and the LDS Church faced four choices—transfer the college to a partnership of the city of Ogden and Weber County, transfer it to the University of Utah as a branch campus, transfer it to the state of Utah as a junior college, or shut it down. In 1931, the Utah Legislature passed a law providing for the acquisition of Weber College and Snow College from the LDS Church. In 1933, Weber College became a state-supported junior college. In 1954 the college moved from its downtown location in Ogden to a spacious and scenic area in the southeast bench area of the city. The school became Weber State College in 1962, and in 1964 became a four-year college. It was a charter member of the Big Sky Conference in 1963. The first graduate program (accounting), was added in 1984, and it gained university status on January 1, 1991. Weber State University has developed into a major state undergraduate institution serving northern Utah and areas beyond, including American and international students. The university sits along the east bench of the Wasatch Mountains in Ogden; the Dee Events Center for indoor athletics is located about one mile (1.6 km) south of campus. There is an additional campus in Davis County and two centers in Morgan and Roy. In addition to its physical locations, Weber State University has been a pioneer in the development of online education for the Utah System of Higher Education. The Ogden campus covers more than 500 acres (2.0 km2), houses 63 buildings and features residence halls that accommodate more than 1,000 students. The Davis campus has two buildings, which host more than 300 classes per semester. In 2013, Weber State opened WSU Downtown, an 18,000-square-foot (1,670 m2) building on 2314 Washington Blvd., which houses a WSU Wildcat Store, cafe, the WSU Small Business Development Center, Startup Ogden, and an open co-working space. Weber State also has centers in Roy, Farmington, Kaysville, Clearfield, and Morgan, Utah, in addition to the Community Education Center in Ogden. Weber State University's colors are purple and white and their nickname is the Wildcats. (Wildcat is an alternate name for the bobcat, a cat native to the area.) The teams participate in NCAA Division I in the Big Sky Conference; the football team (Football Championship Subdivision) plays at Stewart Stadium. The men's and women's basketball teams both play at the Dee Events Center. Additional athletic programs are men's and women's track and field, men's and women's golf, men's and women's tennis, and women's soccer, cheerleading, dance, volleyball, and softball. When the University of Idaho and Boise State University left the Big Sky in 1996, Idaho State University in nearby Pocatello became Weber State's main rival in both football and basketball. Southern Utah University (in Cedar City) joined the Big Sky in 2012 and is the main in-state rival. Weber State also has 17 club sports through Campus Recreation, including ice hockey, men and women's rugby, archery, baseball, billiards, bowling, cycling, fencing, martial arts, rodeo, rock climbing, skiing, snowboarding, weightlifting, wrestling, and lacrosse. Weber State University offers more than 250 certificate and degree programs in the performing arts, visual arts, humanities, science, applied science and technology, business and economics, education, social and behavioral sciences and the health professions. Weber State University also offers an integrated studies degree, allowing students to craft their own degrees by choosing three separate disciplines and integrating them in a single capstone thesis or project. Master's degrees are offered in accounting, athletic training, business administration (MBA), professional communication, computer engineering, criminal justice, education, English, radiologic sciences, health administration, nursing and taxation. Weber State University has an independent, student-run newspaper, The Signpost, which is published every Monday and Thursday, an online radio station, KWCR – Weber FM, Ogden's Radio Station, an undergraduate interdisciplinary literary journal, Metaphor, and a television news program, Weber State News, that broadcasts online. The national literature and culture journal, Weber Studies, is based at Weber State. Joseph Bishop - Past president of Weber State. ^ "WSU's Fall Enrollment Sets Another Milestone". Weber.edu. 2012-10-12. Retrieved 2015-12-21. ^ "Color Palette". Retrieved 2015-12-21. 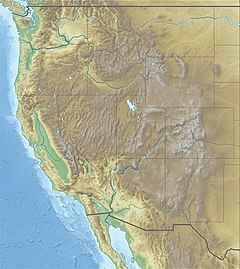 ^ "NWCCU Institutions of Utah". Nwccu.org. Archived from the original on 2012-02-13. Retrieved 2012-05-01. ^ "Weber State University: Bell Tower". Weber.edu. Retrieved 2012-05-01. ^ a b "Timeline". www.weber.edu. Retrieved 27 September 2018. ^ "History". Weber State University. Archived from the original on 2013-01-28. Retrieved 2013-01-28. ^ Varela, Vicki (August 23, 1984). " 'University' not part of WSC's high goals". Deseret News. (Salt Lake City, Utah). p. B1. ^ "Out with the old – New Year's Eve bash will usher in 'new' Weber State University". Deseret News. (Salt Lake City, Utah). December 25, 1990. Retrieved January 30, 2019. ^ "Fast Facts". Weber.edu. Retrieved 2015-12-21. ^ "WSU Downtown". Weber.edu. Retrieved 2015-12-21. ^ "Campuses & Locations". Weber.edu. Retrieved 2015-12-21. ^ "Why Wildcats?". weber.edu. Retrieved 2012-07-27. ^ "Lists of Clubs & Organizations". Weber.edu. Retrieved 2015-12-21. ^ "Majors, Minors, Certificates & Degrees". Majors, Minors, Certificates & Degrees. Retrieved 16 July 2011. ^ "BIS Home Page". Weber State University. Retrieved 22 February 2013. ^ "WSU Graduate gives 2 years for school.Programs". WSU Graduate Programs. ^ "weber.edu". weber.edu. Retrieved 16 July 2011. ^ "The College of Engineering, Applied Science and Technology". Weber.edu. Retrieved 2015-12-21. ^ a b "College of Education". Weber.edu. Retrieved 2015-12-21. ^ "College of Social & Behavioral Sciences". Weber.edu. Retrieved 2015-12-21. ^ "UFC: For onetime Utah walk-on Sean O'Connell, the hard way has been worth it". Retrieved 27 September 2018. Wikimedia Commons has media related to Weber State University.